BUY MY BOMBER JACKET HERE! 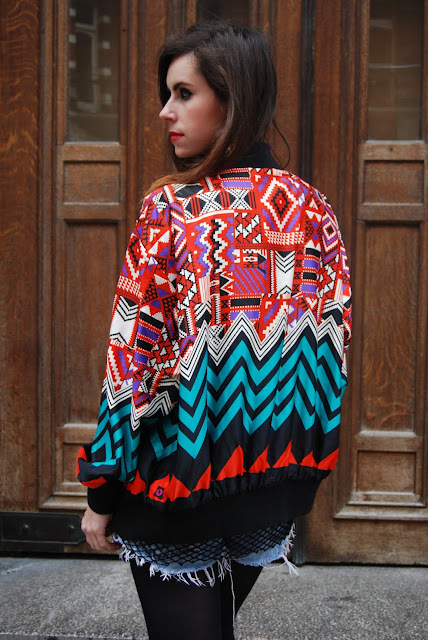 I don't think you can get more me than this bright aztec bomber jacket by Mee Mee. I love the bright prints and it's perfect for me to rock on a night out and make a statement. The colours and print are stunning and the fit is oversized and long which I love as it makes it feel like a retro bomber. It's also totally on trend with the recent sports trends influenced by Rita Ora! I have seen Mee Mee around lot's in magazines and advertised on other blogs and this is one website I am pleased to have stumbled across! The product is unusual, quirky and offer something more than your typical online retailer. I am always looking for something new and fresh that no one has and Mee Mee offers just that, fashionable pieces that don't copy the fashion pack. When I go out I like to wear it loud and wear it proud! You would think I would team the bomber with something toned down- but then it just wouldn't be me! I teamed it with my net best which I love for layering over things. I layered it over my American Apparel leotard, the print fitted perfectly with the bomber yet the netting made it more subtle. I also love wearing denim under net to create a grunge and textured feel. Note the photo of the back of the jacket with net and denim- it's a look full of interest and clever layering. I blinged it up with some gold aztec triangle earrings which went perfectly and my favourite red statement necklace from Zara. The tights make it real as it's so bloody cold for nearly June and of course my Choies cut out boots which are my best friend on a night out.. Come to think, of it all the time! and fall in love just like I did! Love the geometric print clashing, amazing outfit! your aztec bomber looks so cool, I love it!